It can be rather hard finding a trusty professional portable air compressor. You want it to be powerful enough, while still being somewhat lightweight. When talking about air compressors, you probably imagine bulky fixed air compressors. Luckily, air compressors no longer have to be that big to get the job done. It turns out that even smaller air compressors can do great with at-home car repairs. Forget about investing in large, space-consuming machinery. These air tools can help you achieve great results, especially in DIY tasks. Since they’re pretty compact, they’re also very easy to manage. 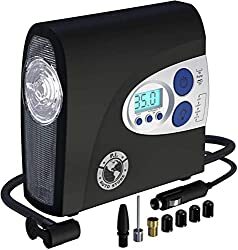 Here’s the deal: in this review you’ll find the best portable air compressors of 2019. From spray painting and dealing with flat tires, to powering a sander – you can do it all. These cheap portable air compressors represent strength and power in a mobile device. Without further ado, let’s proceed to the models. The best value air compressor delivers a perfect mix of quality and price. Also, top portable air compressors have a gauge which makes everything crystal clear. Before you buy an air compressor, you must do your research about different models. To make it easier on you, here’s a list of the top 11 portable air compressors of 2019 from the best manufacturers. Depending on the type of the task you need the air compressor for, weight has a great significance. To be able to carry it in your car, you need a lightweight portable air compressor. If the mobility isn’t crucial, you can opt for good air compressors which aren’t as lightweight. However, the warranty is important if you want to be able to fully rely on your air compressor. What makes this air compressor particularly convenient is its size. Due to its compactness, it is definitely one of the best portable air compressors. 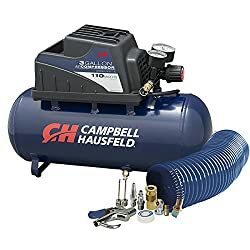 This is an air compressor you need if you want to be able to take it anywhere with you. Due to its lightweight design, you can use it on the go, or just have it in your car. In fact, you never know when you’re going to end up needing a powerful air compressor. Weighing only 26 pounds, it is a very good air compressor which doesn’t require a lot of maintenance. Having to worry about maintaining your air compressor can be a bit overwhelming. Thankfully, this Pancake air compressor has a quality oil-free pump which can last a long time. The oil-free air compressor pumps can endure years and years of constant use. The 3.5 gallon tank along with 135 PSI allows you to use it in longer intervals. It can be pretty annoying having to interrupt the process due to short run time. Luckily, with this model, that inconvenience isn’t bound to happen. Also, the model promises quick recovery for a consistent process. How many times have you experienced a device failing to start in cold weather? With this air compressor model, you don’t have to worry about such a predicament. Thanks to the 120V motor, the air compressor is able to start in all weather conditions. You can also use it with an extension cord. In addition, there’s a quick-connect coupler. Being this versatile, this air compressor is suitable for any environment. Since it is portable, you can use it outdoors, or inside the house. Another great thing about this cheap powerful air compressor is that it doesn’t produce as much noise. In comparison to similar powerful models, this one is definitely not as noisy. Pancake air compressor is one of the very cheap air compressors which received a great amount of praise. However, with every single device, there are customer complaints. Negative reviews are inevitable, but their credibility is sometimes questionable. Most of the customers reviews are more on a positive side. However, there are certain complaints among the Amazon customer reviews. For instance, some of the customers noticed that the air was leaking. Since the air compressor needs to direct the air to achieve the pressure, this is an issue. For some users, it creates too much of a noise. However, this is a rather subjective matter. While most of the portable air compressors are pretty lightweight and mobile, this one is an exception. Being heavier than other best-value-for-money portable air compressors, it lacks in convenience. However, this model is different than stationary air compressors in many ways. First of all, though not as compact, it still allows you to move it around. It has wheels which make the moving process much easier. The mobility is somewhat limited, but it is not impossible. Aside from the size which some may consider a negative trait, this model offers many advantages. Basically, it combines the power of a stationary air compressor, and a portion of mobility. In addition, the motor makes significantly less noise than the one of the stationary device. With this air compressor, you’re getting the best of both worlds. The quiet performance of a powerful motor is a trait which makes this device really stand out. The sound doesn’t go higher than 70 decibels, which is remarkable. Since this air compressor operates with an oil-free pump, you can expect the least amount of maintenance. Not only is it oil-free, but the pump is also durable and long-lasting. The use of this air compressor is also very versatile. You can use it to power different units and devices, such as air drills. Due to its quality design, you can use it in different conditions and temperatures. If you need an air compressor in an environment which doesn’t tolerate noise, this is the one. As you could already guess, something that the buyers don’t appreciate is the weight of the product. Since it is a portable air compressor, many expect a lightweight, carry-around device. However, this isn’t what you’ll get in this particular model. The attribute ‘portable’ does apply, since you can transport and move the device. However, it doesn’t deliver the same amount of mobility as many other portable air compressors. Another common remark regards the price of the product. 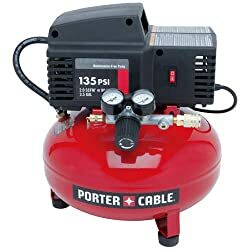 This particular model isn’t among the very cheap air compressors. However, its design, power and versatility of use justify the price. Finally, another significant remark concerns the wheel assembly. According to some reviews, it isn’t as easy as the instructions make it up to be. Many air compressors lack necessary accessories, especially for DIY tasks around the house. Having to buy accessories separately is an additional expense. Also, accessories aren’t always very cheap. Luckily for Campbell Hausfeld users, the device already comes with an accessory kit. The kit includes everything you’d possibly need for any of your tasks. There’s a blow gun, an air chuck, and many other useful tools. Even if the product delivers great strength, you still want it to be easy to work with. This is a very important factor, in order to avoid injuries and mishaps. This air compressor model has a lightweight construction, which makes it portable in every sense of the word. It also has a convenient handle you can use to carry it around. To be able to control and overlook the process, there need to be straight-forward gauges. This cheap air compressor comes with reliable, simple gauges. Another feature that contributes to the reliability is the power. This compressor achieves constant and easy-to-manage power. Hausfled shows great performance in various tasks. Versatility is something you want in a good cheap air compressor. On one hand, you can use it to inflate your tires on any vehicle. Also, on the other hand, it comes in handy with powering brad nailers and similar tools. It’s also great for air brushing and stapling. Generally, it is a great all-around-the-household air compressor. The focal feature of this air compressor regards the minimization of pulses. Thanks to the built-in tank pistons, there isn’t as much pulsation during the process. This is very important when it comes to the convenience and safety. The hose of this air compressor seems to be rather fragile. According to many reviews, it seems to break, even after the first use. However, the good news is that this part is cheap, and it won’t be too hard to find a new one. As frustrating as it can be having to replace parts, this one shouldn’t be too big of an issue. Another issue regards the noise the device makes. Unfortunately, many users report loud performance. However, considering the price of the model, you could shut your eyes on this. 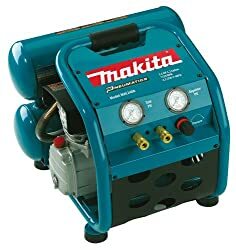 Being that this Makita model doesn’t have an oil-less pump, you may think that it’s high-maintenance. In fact, it isn’t as demanding as it seems to be. As a matter of fact, not having an oil-less pump isn’t particularly a flaw. In fact, according to certain tests, compressors which use oil last longer. This Makita air compressor has a powerful 2.5HP motor. Its amazing design delivers great c power, alongside uninterrupted performance. This device is great for smaller household tasks, as well as demanding construction site environment. The iron cylinder allows the device to recuperate faster, and produce less noise while doing so. Since the compressor uses oil, a good filter is a must. This model includes a filter which is common for automobiles. It protects the machine and guarantees a smoother performance. Thanks to the lubricated pump, the compressor is able to work faster and more efficiently. Since the compressor runs cooler, there’s no fear of overheating. The cast iron cylinder also allows easier and faster maintenance. Since it is removable, you won’t have much job cleaning and assembling the device. What adds to the versatility of this air compressor model is its ability to work in various conditions. Not only can you use it for both smaller and bigger tasks, you can also connect it pretty much anywhere. 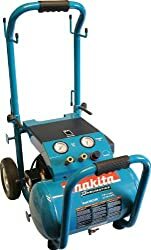 The great adaptability of this air compressor makes it one of the top choices when it comes to portable compressors. To conclude, this model is a great representation of power, versatility, and ease of use. It seems that some customers have trouble changing the filter. When working with lubricated pumps, this can be an issue. Sometimes, the oil can get everywhere, and the job of replacing the filter can get pretty messy. Other than the fact that you have to change the filter, there aren’t any bigger issues. The value of an air compressor is found in its versatility. Why invest in one if you can use it for one job only? The whole purpose of air compressors is to use it for multiple tasks. If your compressor delivers in one area only, it probably isn’t worth the money. Senco compressor has a very diverse use. One of its most important assets is the quality of the design. For a compressor to last, the material has to be impeccable. 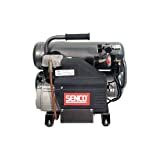 Indeed, the Senco compressor contains cast iron which is known for its longevity. Going deeper into the structure, the motor and other important parts enable the compressor to be very versatile. This workhorse compressor comes with an induction motor for uninterrupted performance. This means that it can deliver great results even in larger work sites. Instead of one, there are two tanks in a stack. These two tanks are a great addition to the main tank. The main tank has the capacity of 4.3 gallons. The capacity of the gallons is important, since there’s more space for the device to store the air. Consequently, the compressor utilizes less energy, being extremely energy-efficient. Not only is this great for your electricity bill, but for the compressor, as well. This kind of system allows it to have a longer life. All these features make this model one of the most convenient portable compressors. Also, its electric-run engine allows you to use it inside the house, without the fear of any malfunctions. Additionally, this model doesn’t create much noise. This characteristic is great, especially if you intend on using the compressor frequently. Loud compressors tend to create an unhealthy, stressful working environment. According to certain customers, the instructions aren’t particularly clear. With devices such as air compressors, this is quite important. If the instructions aren’t straight-forward and easy to follow, there can be multiple issues. The instructions need to tackle topics such as maintenance, assembly, potential mishaps, etc. If the user can’t find these pieces of information, the ease of jeopardized. Another user complaint aims at the weight of the device. Since it is portable, some customers feel that it could be lighter. This would result in easier transportation. Also, another flaw is its ability to start on low temperatures. If the weather is cold, you may have trouble starting it outside. However, warming it up inside the house for a couple of minutes should be enough. Makita compressors have a great reputation when it comes to quality and diversity. This particular model has a 3.0HP motor which can endure even demanding, big tasks. What can happen to such powerful motors is that they reach a point where they overheat. However, Makita has this issue covered, thanks to the protection against thermal overload. Another important feature is an iron cylinder which increases compression. It also makes sure that the noise level remains very low. Thanks to it, the motor is able to recover quickly and continue the process. The compressor consists of cast iron which makes the design very reliable and durable. This is something to pay attention to, especially if you’re using the compressor frequently. This kind of design is adequate for work sites and harsh conditions. The oil-lubricated pump allows the device to work smoothly and consistently. For better results and protection against malfunction, there’s also a filter. This filter resembles those of cars and similar vehicles. It guarantees reliability and efficiency. Another great characteristic of an oil-lubricated pump is that it doesn’t overheat. This is very important, especially for bigger jobs. What makes the machine stand out is its roll-cage design. Although this design seems purely esthetic, it has a greater purpose. In fact, it protects the motor, as well as the pump. This is particularly important in touch work sites where you can’t be very careful. The unique design also allows you to store accessories and air fittings inside the compressor itself. This is very convenient, since you don’t have to worry about bringing additional kits and bags. Basically, all you need is already inside the compressor. The accessories which accompany this model include an oil drain, as well as an oil sight glass. Since the air compressor pump isn’t oil-less, the machine requires oil which you have to add from time to time. Some of the Amazon customers find the quantity of the oil which comes with the device insufficient. While you can buy the oil separately, some users would prefer more of it to come with the compressor. Just like with the previous Makita model, the filter change isn’t a favorite thing for some users. However, the fact that you don’t have to do it as often can be rather comforting. Looking for less noise in a compressor? Air compressors tend to be pretty loud, and it can be rather disturbing. 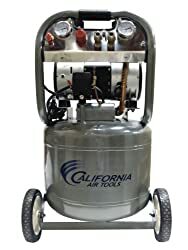 This California Air Tools compressor is one of the best models when it comes to quiet performance. At 60 decibels, you’ll hardly even notice it’s on. This means that you’ll be able to have a normal conversation even if you’re standing right by the machine. Not only are you going to be unbothered by it, but you’ll also love the performance level. What makes the machine so quiet, and yet so powerful, is the motor. Its 1HP motor enables the machine to work quietly, yet efficiently, at 1680RPM. This also means that there’ll be less wear in your compressor. If you don’t want to deal with oil and filters, here’s the answer. This air compressor operates with an oil-free pump, enabling you to work in various conditions. When it comes to the design, most of the compressors have horizontal air tanks. However, this one has a rather unique design. The horizontal tank expands the capacity, and also contributes to mobility. Another feature that distinguishes this model from the rest is the water trap. Its purpose is to catch the dripping water from the air, protecting the device. Excess water can be the root of numerous problems. Therefore, this is a rather important part of this compressor. Since this model is ultra-quiet, you can use it anywhere. What contributes to its versatility are the included accessories. The package includes a USB charging cable, as well as a folio with keyboard. Thanks to the USB charging cable, you can literally take the device anywhere with you. 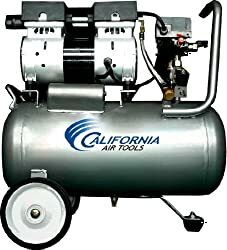 This California air compressor model is very durable and gives you better services all this time. It’s soundless and maintains that quality for a very long time, so long as you keep in in good condition. The tank can stay for a very extended period without requesting for a refill or replacement of the hose. Some customers find that the smell the device produces is too strong. However, this didn’t stop them from using the compressor regularly. Aside from this small flaw, they haven’t noticed any significant downsides. On the other hand, a small portion of users experienced overheating. However, keep in mind that this is something that can occur with any compressor, or device for that matter. It is important to follow and respect the instructions and not go overboard with your compressor. Otherwise, it is only natural for it to reach its breaking point. This is one of the portable air compressors which usually have a specific purpose. Since it is a digital tire inflator, this is exactly what most of the customers use it for. Being very lightweight and compact, you can carry it around and use it for different vehicles. Its convenience in use doesn’t stop here. To start it, you can simply plug it into the cigarette lighter socket of your car. After doing so, you’ll be able to use the device, without having to worry about batteries and power outlets. This is particularly convenient when it comes to travelling. Therefore, this compressor is a great addition to your regular car equipment. You don’t have to use it in your car only. As a matter of fact, this model doesn’t lack in versatility. You can also put it to work when inflating bike tires. However, you should know that there are certain models of tires this compressor doesn’t work with. For instance, this model doesn’t support HT, LT, or truck tires. Since it comes with different inflators, the package includes an adaptor for each of them. The adaptors make the entire process much easier. Speaking of making the process simpler, there are also 4 display units. Each of them is easy to read, making the procedure effortless. Once the pressure in the tire is at a certain level, there’s an automatic shut-off setting. Not only is this very convenient, but it also keeps you safe. There aren’t any particularly bad reviews when it comes to this compressor. What the customers may find unsatisfactory is the fact that it has a very specific purpose. While it isn’t as versatile as the rest of the compressors, it surely does a great job at inflating tires. One of the best attributes to describe this tire inflator is simplicity. Simplicity is present in its design, use, and settings. This is something you should gravitate towards if you’re looking for a good compressor for a specific use. Obviously, this compressor is a digital tire inflator, and its purpose doesn’t stretch any further. However, if you need a compressor for this purpose only, it is all you need. To start the inflator, all you need to do it plug it into the cigarette lighter socket. If the lighter is less than 12V, you’ll need another power source. The device also has a LCD display gauge which is very easy to read. It’ll give you all the information you need, and allow you to control the process. You can use it to set the desired pressure. Once the device reaches that level of pressure, it’ll automatically stop. Another great feature of this model is that it performs quickly and efficiently. It can reach pressure of 150Psi. To give a concrete example, it can inflate a car tire to 30Psi in less than 4 minutes. Due to its high efficiency, you can use it for your car, motorcycle, bike, or even truck. What supports its efficiency is the high-quality design, thanks to which the device has a long life. Finally, since it weighs only 2 pounds, you can keep it in your car without even noticing it. It won’t take up much of your storage space, since it is very compact. An overall impression about this product seems to be rather positive. However, some customers have had certain unpleasant experiences. For example, the handle broke the first time the customer tried to use the device. The second issue regards the inability of this compressor to inflate bigger tires. While the manufacturer promises great power, it is common for devices this small to fail with bigger tires. 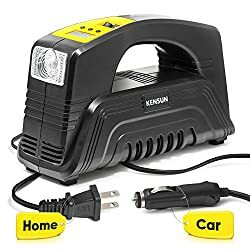 Weighing only 5 pounds, this Kensun tire inflator is a great choice for your car. You can keep it in your car without it taking up too much space. It is important for compressors of this type to be able to fit in your car. Also, the lightweight design allows you to manage them easily. This tire inflator brings more versatility than most of the tire inflators on the market. Not only can you use it in your car, but in your house, as well. Since it adapts to both AC (wall socket) and DC (cigarette lighter socket), there’s much you can achieve with it. Considering the fact that you can use it in both locations, its versatility is hard to match. 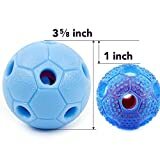 You can inflate anything from car tires, to smaller stuff such as balls. The inflator has a digital LCD display, as well as unit conversion. This allows you to adjust the pressure according to the task you’re working on. The best thing about it is that it delivers continuous process for 30 minutes with the pressure at 35psi. What can be rather challenging is using tire inflators in the dark. You don’t always have a flash light with you, and even if you do, it is too much work. Conveniently, this compressor has its own work-light on the LCD display. This means that you can use your inflator in all conditions. The negative reviews for this particular model seem to be lacking. The customers love it so much, that there isn’t a single negative remark that stands out. One customer had a delivery issue, which doesn’t have much to do with the product itself. The JACO tire inflator possesses all the crucial qualities of a tire inflator. It is lightweight, compact, and portable. On top of it, it is quick and efficient. In fact, it can inflate 35L/min. Another incredibly important feature regards the construction of the inflator itself. This is important not only to have your compressor for a long time, but for your safety, as well. This tire inflator offers the highest quality in its design and components. The elements are metal, as well as the heat dissipation. The LED display comes with a bright light which allows you to use the device in all conditions. Also, it has a protective role, as well. The 25” air hose has a quality nozzle which guarantees a good seal to the tire without an exception. Additionally, the nozzle and the remaining components also consist of quality metal. This tire inflator does a great job at maintaining a certain pressure level. What this ensures is a smooth operation and a good result each and every time. This is also important in order to avoid failure which under-inflation can cause. Additionally, your tires will last longer, since they’ll be even and secure every single time. The quality of the tires consequently affects the quality of the car performance. Therefore, the purpose of a good tire inflator is much deeper. What the customers find to be inaccurate about this product is the display gauge. Apparently, it doesn’t seem to show the correct information all the time. The customers find this issue frustrating, since they can’t tell whether the pressure is really at a certain level. Other than that, the users seem to love this tire inflator. An air compressor can have various uses in everyday life. The primary purpose of a portable air compressor is inflating the tires of vehicles. You can use them to inflate car, bike, motorcycle, or even truck tires. Depending on their power, their purpose may vary. Aside from tires, you can also inflate other objects, such as balls. Since portable air compressors are usually very compact, you can easily take them with you. It is always wise to have one of these in the back of your car. Another important use of an air compressor is powering other devices. For instance, it comes in handy for tasks such as air compressor for spray painting. Air compressors which offer more power can serve as a power source for other tools, such as brad nailers, or even sanders. Basically, the air compressor turns power into energy in the air, which is under the pressure. The process of storing air is what actually creates the pressure. Once you shut off the compressor, the remaining air stays under the pressure. Starting the compressor again means utilizing the remaining air. There are stationary, fixed air compressors which usually offer more power. However, the advantages of portable air compressors are countless. Not only can you take them with you, but you can also position them the way you want. Therefore, you have more freedom when it comes to air compressor use and management. Most of air compressors come with a display gauge. This feature allows you to control and keep track of the procedure. Many of these gauges allow you to set the pressure, according to the task you’re working on. There’s also a significant difference in the pump type. There are oil-lubricated and oil-less compressor pumps. While the oil-lubricated type seems to be more rewarding, the oil-less pumps are gaining more popularity. Using an oil-lubricated pump means requiring an oil filter, as well. The more features an air compressor possesses, the more versatility it’ll provide. Compressors usually come with a number of different accessories. For the most part, the purpose of these accessories is adapting the compressor to different devices. For instance, you need a different adaptor or nozzle for different kinds of tires. Also, the most versatile models are suitable for different power outlets. Different kinds of adaptors, nozzles, and similar accessories create this guarantee of adaptability. Some compressors come with an accessory kit. The kits usually contain everything you could possibly need for your compressor. Besides the attachments, there’s also the equipment you need to maintain the product. When it comes to oil-lubricated pumps, you usually get a supply of oil, and sometimes a filter. The more accessories you get with the device itself – the better. This will lower the additional expenses you’ll have in the future. The compressors which don’t include an accessory supply will probably end up costing a lot more. Another great feature that a compressor can include is a LED display. The LED display is a useful part of every compressor which gives the important information. Also, it allows you to control the pressure, and other important settings. Since we’re talking about portable air compressors, make sure that the portability is ensured. If there’s a handle, the quality of it should be good enough. A handle breaking in the middle of the process could create a big problem. If your portable compressor isn’t as lightweight, it should contain wheels. Portability is something you don’t want to compromise when it comes to portable air compressors. Also, make sure to check for quiet the motor is. Certain models tend to create too much noise, and it isn’t suitable for some areas. Power is one of the prevailing factors when choosing a good air compressor. Why? Simply because it determines the level of performance. A low-power device won’t show great results in big tasks. For example, low-power devices aren’t suitable for tough work site assignments. 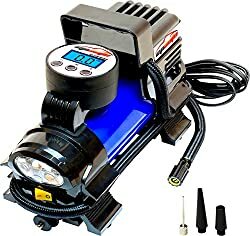 On the other hand, if you need your compressor to inflate a tire here and there, you don’t really require that much power. It all depends on the nature of the task you need the compressor for. If you want your compressor to power other tools such as disc sanders, this is an important element to consider. The motor is the heart of the entire structure. If it isn’t of good quality, all the other factors have no importance. Therefore, the motor is something you don’t want to jeopardize. Besides the power, you want to keep an eye on the design of the motor. Metal constructions give you the longevity and quality you need in a motor. Also, the construction of the compressor itself should protect the motor. If the motor is unprotected, it can lead to serious malfunctions. For your own safety, and the durability of the product, make sure that the motor isn’t on display. Another significant element in a motor is the quietness of its performance. If you aren’t a fan of loud noises, opt for compressors which promise quiet performance. The tank capacity matters if you want your compressor to be very versatile. For basic tire inflators, this isn’t really a factor. However, if you want all the advantages of a compressor, the tank capacity does make a difference. It determines the level and longevity of the performance. Therefore, consider the tank capacity only if you need your compressor to power other tools. In any other case, it isn’t that big of a deal. Performance is crucial, regardless of the type of the task you need the compressor for. Interruption and lack of speed and consistency in compressors can be very discouraging. Therefore, always check the durability of the product. The longer the session – the better the performance. Of course, as long as the process is consistent and reliable. You want your compressor to be able to deliver a consistent level of pressure. You also want to make sure to check the time your device requires to reach a certain level of pressure. The best compressors are able to reach the desired level of pressure, and maintain it throughout the procedure. Also, you should be able to control the pressure. Portable compressors are usually pretty affordable. This is another great thing about them, since stationary machines tend to be rather pricey. As always, you must be realistic about the relationship between the performance and the price. The more diversity a device offers, the higher the price will be. This is something that shouldn’t intimidate you, since these air compressors have a wide purpose. In fact, they can replace various other tools. Additionally, good-quality compressors can last for years, so this is definitely a good investment. However, if you’re only looking for a tire inflator to use from time to time, don’t settle for a high price. As you could see in our product reviews, you can definitely find cheap compressors of this kind. Make sure to check the customer reviews beforehand. These objective reviews can help you make a decision and avoid any impulsive purchases. Consider both the positive and negative traits and see if there’s a balance. There’s a variety of air compressor choices on the market today. Since you’re reading this article, you probably want best-value-for-money portable air compressor. To find best value air compressor, the best strategy is to engage all the mentioned factors. You want a mixture of all these elements in a single device. Depending on what you expect out of your compressor, the choices may vary. This means that different factors will have the most importance. If you want a quiet performance, you’ll consider the noise the motor makes. In case you want the compressor to power other tools, power is your main concern. Either way, regardless of what you’re looking for, search for quality in design. This will ensure that you have your compressor for a long time. Also, the result depends upon the level of performance. Air compressors are surely one of the best air tools you can possess in your equipment.